I recently visited the Virgin Islands for the first time, specifically St. John. Great trip, beautiful place and a welcome escape from the Boston winter. I have much to share about the trip, but first and foremost: transportation. In trip planning, navigating questions around getting somewhere, renting cars and transportation prices can be challenging. I hope the below will help make St. John trip planning just a bit easier. St. John doesn’t have an airport, so getting there requires flying into St. Thomas. I spent very little time on St. Thomas, so I can’t speak to it as a destination. My general impression is that it’s more built up, less quiet and less natural than St. John, a large swath of which is a U.S. National Park. I also found that many travelers were repeat visitors to St, John, and they indicated that as soon as they landed it was always a mad race to get to the ferry and get off of St. Thomas. There are two ferries from St. Thomas to St. John. One leaves hourly from Red Hook Harbor and takes about 15 minutes ($7/person one way), and the other leaves three times a day from Charlotte Amalie and takes about 45 minutes ($13/person one way). There are merits to taking the Charlotte Amalie ferry, if you’re looking to get a different viewpoint/photo opps of the island. But if you just want to get there, the Red Hook ferry is more frequent, and I’m told more reliable. Note that you will also have to pay $4 for each big bag that you have for both ferry options (you pay for tickets and bags before boarding), and the unloading process is not always the quickest. It’s good to have a couple of dollars on hand for a tip. Something else to be aware of is that the ferries don’t always leave right when they’re scheduled (they run on island time), so if you’re a couple of minutes late getting to the harbor, you could still make it! If you’re traveling with a companion, one of you can jump out and get your ferry tickets while the other pays the taxi. The VI Now website is helpful for schedule info, etc. Also, the above is just for passenger ferries. If you need the car barge, you’re on a different schedule and you should check out the VI Now site. There are no shuttles to the ferry from the airport, but there are a number of 15-passenger taxi vans that you can share with other people. According to the repeat visitors in the taxi, there are two ways to get to the Red Hook ferry from the airport: one through town, and one up and over the hills. We went the second, more scenic route. I was glad to not be behind the wheel on the steep, narrow roads. Our lead-footed driver seemed comfortable, though, cruising 15 miles over the speed limit and getting us to the ferry just in time to catch the 5:00pm. The ride takes about 45 minutes and in February 2015, we were charged $15/head. I debated renting a car and ultimately decided against it. For me, it was the right decision. I stayed at Coconut Coast Villas, which is a ten minute walk from Cruz Bay, where the ferry arrives. Cruz Bay is also the hub of all the restaurants and bars on the island, so it was convenient for us to walk from our accommodations into town for meals and activities. For farther away destinations, like all the beaches, wheels are required. But, getting a taxi in Cruz Bay is a cinch. There’s usually someone in charge in the center square of Cruz Bay with a clip board or a name tag who will assign you to a cab and get you on your way. 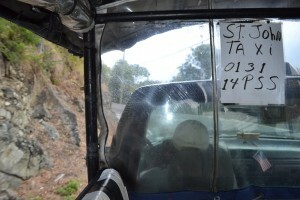 Most cabs in St. John are converted pick-ups with seats build into the truck beds and canopies overtop. Some are 15 passenger vans, but the pick-up style option is more fun! 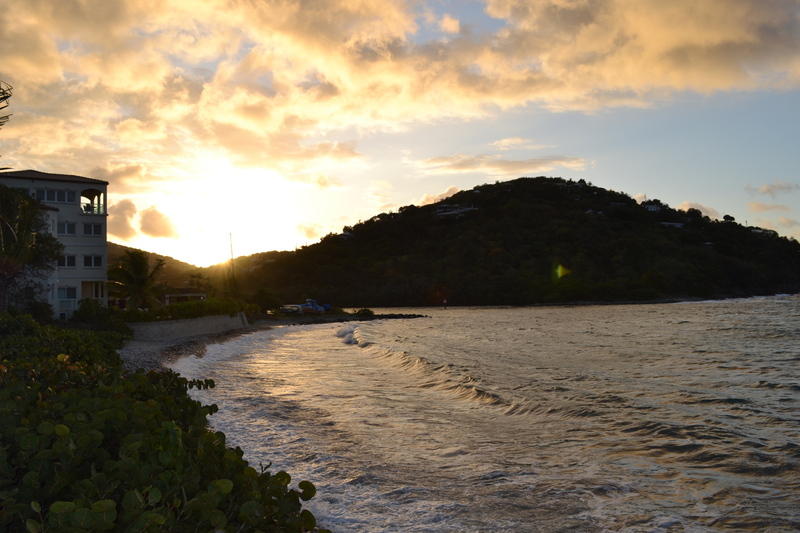 There are often taxis available at some of the popular beaches as well, but not always. I got lucky and found cabs in random spots on the island pretty easily, but I would recommend getting a phone number for a reliable driver from your hotel. Taxis in St. John charge by the person, and many have set prices to go from Cruz Bay to different popular spots on the island. Prices are affordable (it was $6 or $7/person from Cruz Bay to Trunk Bay). You are still expected to tip about 15 percent. For a cheaper (although sometimes less convenient) option, there’s also a bus on the island that costs a mere $1, no matter where you go. I took it once, all the way from Salt Pond on the other side of the island, and it was a great value. The bus was way over air conditioned, though! I was huddled under my beach towel the whole time. In general, I’d advise against renting a car on St. John. It depends on the individual, of course, but in my experience taxis, buses and feet did the trick perfectly, and at a much more affordable price. If you do decide to rent a car, remember that even in the U.S. Virgin Islands, you’ll have to drive on the left side of the road.